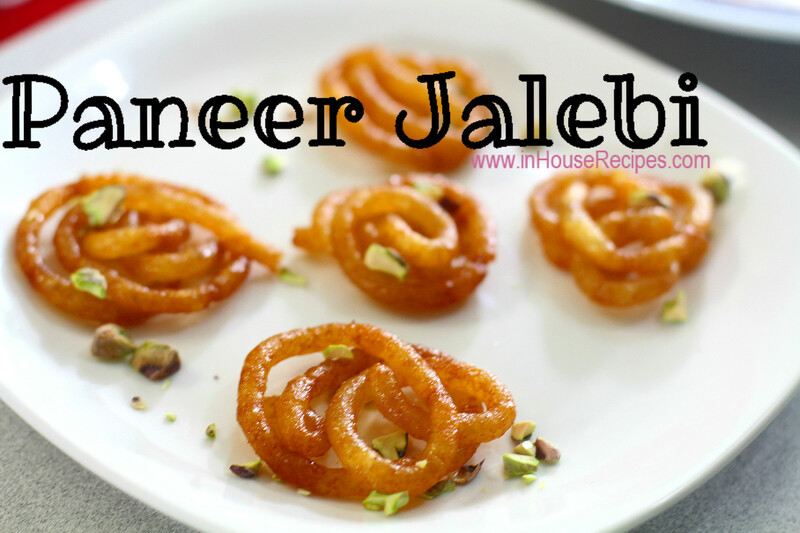 Paneer Jalebi is a great desi dessert for Paneer lovers. Paneer, as you know is counted as a premium ingredient for vegetarians; we thought of trying this recipe to re-create the same restaurant taste at home. We used pretty basic ingredients again and have come up with this recipe. Contrary to the perception that Jalebi is a difficult recipe to make, I would say that it is indeed much simpler than anything else. Paneer is simply crushed and added to the Jalebi batter. The tough part is only the one, where you have to get the Jalebi design straight in the frying pan. If you have ever tried your hands at it, you would know what I am talking about. I hope you would certainly try this recipe and share your valuable inputs. And yes, if you know of a better way of making this recipe, do share it with us and we would love to learn from your tips. 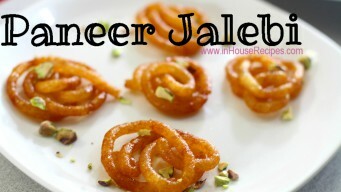 Today we are going to make instant Paneer Jalebi. It is also known as Chanar Jalebi in Bengal. Are there more synonyms or names that we don’t know? please help us in comments if you know. Take crumbled Paneer in a big plate or a tray. Knead it with the help of your hand for about 1 minute. After kneading for about 1 minute, it would get smoother in texture and would feel soft to your hands. Now add All-Purpose-Flour Maida to this paneer. Again knead it with hands or you can mix it in a grinder. Knead for about 2-3 minutes. Once you are done, add 1 Tbsp of Milk and knead it once again. Once mixed, add another 1 Tbsp of Milk and knead it for another 2 minutes. Make sure that you follow the kneading process as mentioned above. This is important to help Paneer gel with the Maida. We will call this paste our Jalebi Batter now. Using Jalebi maker tube or a home made plastic bag? You can use plastic bag normally the milk carrying plastic bags in India or any zip-lock plastic bag for carrying Jalebi Batter. You need to be extra careful while frying with any plastic bag. They stand a chance to burst with pressure. We have a bad experience with using plastic bag, so we do not recommend using it. We recommend using Jalebi maker a plastic bottle with a small circle shaped opening on its head or a ketchup/sauce dispenser for safe frying experience. Add or pour the Paneer Jalebi batter in the Jalebi Maker or the bottle or the plastic bag depending upon what you are using. Jalebi batter is absolutely ready. Now we will start with making 1 string consistent Sugar syrup. Add Sugar, Water and Cardamom Powder in a pan. Switch ON the stove on high flame and wait for 1 boil. After 1 boil, turn the stove to medium flame. Cook until you get 1 string consistency. This will take approximately 10 minutes. Stir the syrup every 2 minutes. After 10 minutes, we should check the consistency of the syrup to see if it is ready or not. To Check 1 string consistency: Take a drop of syrup in a spoon. Use your thumb and first together to pick this drop of syrup. The drop should now be placed between your thumb and finger’s tip. Stretch finger and thumb apart to about 1 cm. If you see 1 string of syrup forming up, the Chashni is ready. If not, it needs 2 more minutes of cooking time. Generally, 10 minutes are good enough for making a 1 string Chashni, but if you get un-lucky, 2 more minutes would help. Once the syrup passes the 1 string consistency test, the Chashni is ready. Keep the Sugar syrup aside and take another pan. Fill it up with Oil upto 75% depth. We recommend using a flat surface pan with low depth of about 3-4 inches. There is no hard and fast rule for the frying pan. If you do not have such flat-bottom low-depth frying pan, you can use whatever frying pan you have. Lets keep the momentum going. Heat Oil on high flame. This should take about 3-4 minutes. Once Oil is hot enough, turn the stove to medium flame. This is important. Do NOT add jalebi on high flame. Frying on medium flame will help in making crispy and evenly colored Jalebis. Start pouring the Paneer jalebi batter in the frying pan. It is a bit difficult to explain what you should do here to make a perfect Jalebi design. You can give it whatever shape you want to give….some guys even try to write ‘I Love You’. The theory book says that start with pouring the first drop and then follow with circular drops around it. This helps in binding the first drop with other circular batter drops. Let the jalebi fry until it turns light golden brown from both sides. Off-course you would need to flip it as and when required. Once you see the color coming up, pick the jalebi and straightaway dip/sub-merge it in Chashni. Let it sit there for about 2 minutes. After 2 minutes, do not wait and immediately serve or eat the hot Paneer jalebi! Well, Paneer can be refrigerated and re-heated for a couple of days normally 3-4 days. Believe me, the taste of fresh Paneer jalebi is far better than the one which has been refrigerated. Make it hot, Serve it fresh straight out of hot Chashni to get the best compliments. Some people like to eat Jalebi with hot glass of milk. What they do is dip it in the milk and then take a bite. It sounds a bit odd but it tastes awesome that way too. Do try and share your tongue’s stint with Jalebi + Milk! Enjoy..